The museum is closed on Mondays throughout the year. And also on 1 January, 1 May, 24, 25 and 26 December and two local holidays. Free admission: Saturday afternoons, Sunday mornings and the following days: 18 April (World Heritage Day), 18 May (International Museum Day), 12 October (Columbus Day), 6 December (Spanish Constitution Day). The history of this museum goes back to 16th century, when Fernando de Vera y Vargas began putting together his epigraphic collection. 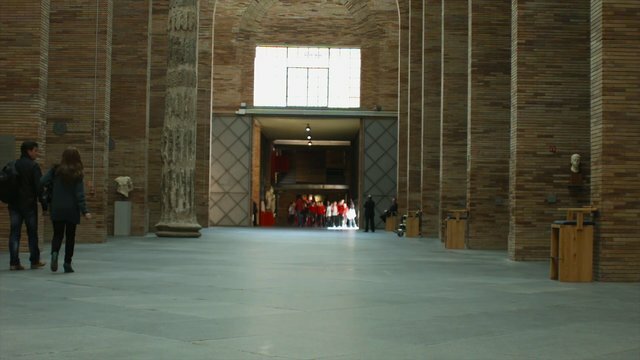 After various transformations during the following centuries, it was in 1975, on the occasion of the city's two-thousandth anniversary, that a decision was made to create the National Roman Art Museum – the first one outside Madrid to have the rank of "National". And in 1986, the current building was opened to shelter Mérida's archaeological objects, of which there are now thousands. This building, planned by Rafael Moneo, is sure to quickly attract your attention as it perfectly combines modernity with the Roman nature of the city and pays tribute to classical building style with its space distribution, which you can see in its ample size, with the interior full of slim arches and zenithal illumination. The central space is used for the permanent exhibition, which you are sure to appreciate. Ensconced in the archaeological ensemble of Mérida, which was declared UNESCO World Heritage in 1993, the MNAR works incessantly researching and spreading Roman culture, especially with reference to this city, the ancient Augusta Emerita, capital of Lusitania. The museum provides a programme of very different types of activities targeted at a variety of publics. And so, thanks to the large number of congresses, discussions, conferences, courses and exhibitions that it holds, the National Roman Art Museum has turned into an essential cultural model for Mérida since its opening. This museum also has its own publication, the magazine Anas, and an active Friends of the Museum Association, which integrate this place into the social fabric of the city. The Roman spirit of Mérida fills the streets, squares, and all the stones that still lie in its walls. The Silver Route became the main way to transport goods, and for people, animals and soldiers travelling along the west of the Iberian Peninsula.